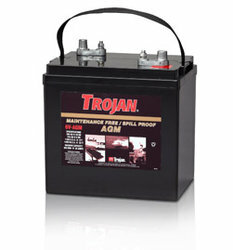 Trojan 6V-AGM 6 Volt Battery Free Delivery to Most locations in the Northeast States. If you do not have a battery of the same group size to exchange you will need to add one core charge $30.00 per battery purchased. Due to some state laws, municipal and county ordinances, batteries may only be delivered to a commercial address. PLEASE CALL US @ 888-737-5681 PRIOR TO PLACING YOUR ORDER SO WE CAN MAKE SURE THE BATTERY YOU ARE ORDERING IS IN STOCK AT THE NEAREST WAREHOUSE TO YOUR LOCATION. THIS WILL INSURE PROMPT DELIVERY.